This user-friendly book will be a handy resource for new preceptors, those considering becoming preceptors, and seasoned preceptors in any practice setting. This user-friendly book will be a handy resource for new preceptors, those considering becoming preceptors, and seasoned preceptors in any practice setting. 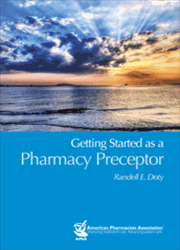 Written in a conversational tone and containing examples and illustrated cases, Getting Started as a Pharmacy Preceptor covers the essential information to become and succeed as a pharmacy preceptor for introductory and advanced pharmacy practice experiences (IPPEs and APPEs). • Are You Doing This for the Right Reasons?